Australia's Test vice-captain Michael Clarke believes Pakistan's fast bowlers will be a handful during the upcoming Test series, on the evidence of their strong performances in the two Twenty20s at Edgbaston. The Australians found Mohammad Aamer and Umar Gul difficult prospects during the Twenty20s and both men are in the Test squad, where they will be joined by Mohammad Asif. Add the coaching expertise of Waqar Younis and the swing of the red Duke ball, and the attack could cause problems in English conditions. Australia found the curving ball hard to counter during their 2005 Ashes defeat and they again failed to win last year, which means they haven't triumphed in a Test series in England since 2001. 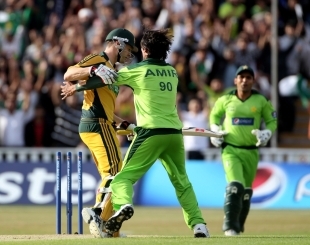 "They're going to be tough opposition in the Test match," Clarke said of Shahid Afridi's men. "They're going to have a very good attack, so our batters have to be at our best with the Duke ball that I'll imagine they'll get to swing, in conditions where, if it's overcast, it's going to be quite tough. I think we're in for a really good Test series. "If it's overcast here, I think they'll swing the ball nicely and they've got some pace as well. I think the Duke will help them. Conditions play a big part in England as to how much swing there is. If it's overcast there's generally a bit of swing the whole day. Hopefully the sun's out." On Thursday, Australia will play with the red Duke for the first time on the tour when they begin a two-day warm-up match against Derbyshire. It will be a good opportunity for the selectors to see Ben Hilfenhaus, Australia's best exponent of swing, in action after his seven-month lay-off due to knee tendonitis. At the same time, Pakistan will be honing their skills with a tour game against Leicestershire. The first Test begins at Lord's next Tuesday, before the teams move on to Headingley for the second Test beginning on July 21.